Dental implants are a great way to replace missing teeth and also provide a fixed solution to having removable partial or complete dentures. Implants provide excellent support and stability for these dental appliances. Dental implants are artificial roots and teeth (usually titanium) that are surgically placed into the upper or lower jaw bone by a dentist or Periodontist - a specialist of the gums and supporting bone. 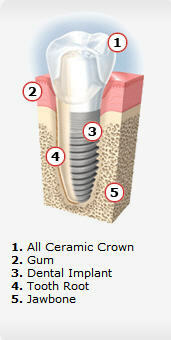 The teeth attached to implants are very natural looking and often enhance or restore a patient’s smile! Below are just some of the many implant dentistry services we regularly provide to our patients – with a gentle touch, and stunning results. Your smile is our first priority, and we’ll give you something to smile about. Here at the office of William M. Grover, DDS, we truly value our patients and place emphasis on care and respect in our practice. Your satisfaction with treatment is of the utmost importance to us. Please contact us if you have any questions, Dr. Grover is proud to provide dental implants to patients in Grapevine, Southlake, Colleyville and surrounding areas of northeast Texas.